In the last episode, Angela Allen of LivingSmall.com shared her philosophy and enthusiasm for downsizing and simplifying. We talked about tiny houses (Angela lives in a very small cabin) but the conversation evolved into so much more than that. In a very general sense, it became a discussion about figuring out what is important in life. And for Angela, working for a house and becoming a slave to the bank was not part of the equation. And so I began to reevaluate my own priorities. We have been trapped in our money pit for more than a decade. The previous owner did a lot of damage with his handy work. We have had to sacrifice and scrimp and save so that we could repair that damage and make improvements. As we are preparing to tear down and rebuild the family room addition, I am feeling the stress and trepidation of going back into debt. After talking to Angela, I finally concluded what I have suspected for a long time. My family and I are going to have to make a difficult, life-changing decision. In this podcast episode, I elaborate on a few of the topics Angela talked about last week, plus I talk about our own decision. Be sure to listen to Episode 9 of the Thumb and Hammer Podcast for my conversation with Angela Allen. I also talk about redecorating my daughter’s over-sized bedroom. I have also previously written blog posts about how we would go about financing the addition . Speaking of my daughter’s bedroom, here is a photo of it. 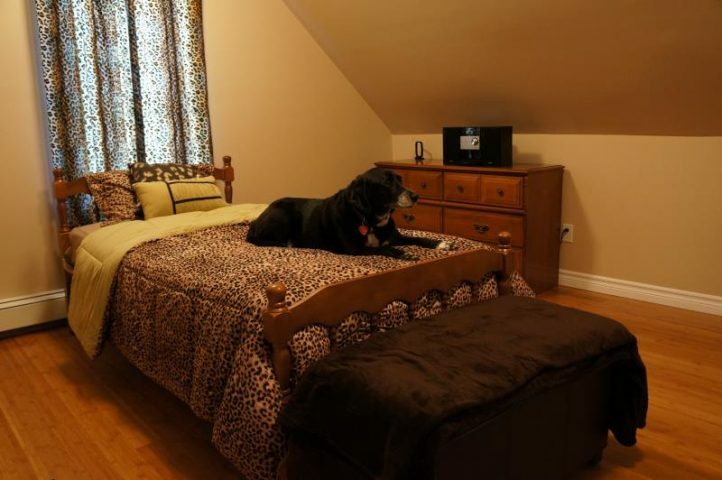 That’s our black lab enjoying the new bedding. You’ll understand the significance of that if you listen to the entire podcast episode.